Vegan Bytes #08: Happy Vegan New Year! One of the most exciting updates to Vegan Nutritionista has been a series of interviews I've done with several famous vegans. I love hearing why other people went vegan, and how their journey has progressed along the way. There are hundreds of famous vegans that you can look to for support if you ever need any. What you will notice about each of the different interviewees is that although they have common ties, they are all such individuals. Dreena Burton has published three enormously popular cookbooks and has more on the way. She shares some secrets to her success. Isa Chandra Moskowitz is the highest selling vegan cookbook author, and is in the process of working on two additional cookbooks. 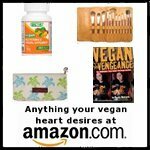 Jennifer McCann writes a blog and published a book by the same name, Vegan Lunch Box. She has the most creative and adorable lunch box ideas ever. Fat Free Vegan blogger Susan V. Her blog focuses on eliminating added fats, but does include some ingredients that are naturally higher in fat, like nuts and avocados. Eat'n Veg'n blogger, Diann Mayer. Diann's blog has a Southwestern flair and reflects her interest in healthy cuisine. Conscious Kitchen blogger, Emilie Hardman. Emilie's blog is absolutely gorgeous and shows her talents for pastries and combining flavors. Urban Vegan blogger and cookbook writer, Dynise Balcavage. Dynise's blog showcases her life in Philadelphia, with reviews on great restaurants, cultural events, travel, and loft-living and cooking. Urban Housewife blogger and specialty baker, Melisser. Melisser's blog also has a city-living flair, and shows the cute creations that she sells in the San Francisco area. Vegan Dad's blog reflects the life of a busy family, with plenty of kid-friendly recipes (that adults will love as well) and anecdotes about cooking. The new year always brings resolutions to improve. I'm evaluating the Vegan Nutritionista.com website and newsletter Vegan Bytes to look for ways to make both better for you. Will you please take a few moments to answer a really quick questionnaire? Your answers will help to develop the future of VeganNutritionista.com. Click here to visit the questionnaire. A friend of mine has recently been diagnosed with Type 2 Diabetes and he was told a vegan diet could reduce the symptoms or even fix it. Can you please advise a starting point for him. I'm not sure where to begin to research but it needs to be simple things to start e.g. lunch on the go seems to be the hardest one at present. I have read quite a bit about diet and type 2 diabetes. In some cases, people are able to reduce or eliminate their insulin needs. Here is a page on a study done by Dr. Anderson. This is just one of many studies done on the topic. Even the American Dietetic Association (ADA) recently uncovered that a vegan diet is more effective at preventing and reversing diabetes than their own diet recommendations. There are also tons of amazing books out there written by doctors who give extraordinary answers to your very questions. One I love is Dr. Neal Barnard's Program for Reversing Diabetes: The Scientifically Proven System for Reversing Diabetes without Drugs. Dr. Barnard's book provides data from studies on diabetes that shows patients whose lives were completely changed from moving to a plant-based diet. Another great book on the health benefits of the vegan diet is The China Study. As far as lunches, the easiest thing to grab tends to be a hummus and veggie sandwich. You can prepare it at home or find them at most restaurants, and it is often nutritionally complete. I would advise picking up a whole grain roll and packing as many vegetables into the sandwich as possible. Also, a piece of fruit would make a great dessert. Other great lunches are leftovers from dinner the night before, which can often be microwaved or thrown into a sandwich. When it gets cold, dark, and windy outside, there's not much better than cooking a giant pot of bean chili and sitting by a warm fire with a bowl. There are standard, easy recipes for the winter soup, and what's great about it is that once you've made one, you can customize to make your favorite dish. This recipe is my favorite; it's savory and has just the right amount of heat and cooks up in under an hour. Check out my favorite vegan chili recipe.